Watch out for the Pinoy Pride 45: Quest for Greatness Live Streaming, Fight Results, Replay tonight November 24, 2018. It's a tripple header for the 3 Pinoy Champions versus foreign foes. Here's the Complete Fight Card. This Saturday night, Nov. 24, when he takes on his first Mexican opponent, Uriel Lopez, in the main event of Pinoy Pride 45 - “Quest for Greatness” at the IEC Convention Center. “If he’s looking for a knockout, I’ll also be looking for a knockout. He’s a Mexican, he’s tough, but I want to knock him out. We both have fighting in our blood and one of us is going down,” said Santisima. Santisima defends his World Boxing Organization (WBO) Oriental super bantamweight strap. “I won’t let him get the momentum and knock him out quickly,” he said. The 22-year-old Santisima, who has been known for his power, has a record of 16 wins, two losses and 14 knockouts. He has knocked out his last three opponents. Santisima (16-2, 14 KO) is unbeaten since 2014 and is riding a remarkable 14-fight winning streak. Santisima captured his first championship back in June of 2018 with a third-round TKO victory over Likit Chane to claim the WBO Oriental Super Bantamweight title. Looking to make Santisima’s title reign a short one is Mexico City’s Lopez (13-6-1, 6 KO), who’s won six of his last seven contests. The current reigning WBC Latino Super Bantamweight Interim Champion, Lopez is looking to add the WBO Oriental title to his list of accolades. Also on the card, the blonde-haired bomber himself, “Prince” Albert Pagara of Maasin, Southern Leyte will be making his return to the ring to defend his WBO Inter-Continental Super Bantamweight Championship against Ghanaian George Krampah. The hard-hitting Pagara (30-1, 21 KO) is working his way back up to the top of the super bantamweight ranks, and is currently on a solid four-fight winning streak. In his last outing, the 24-year old reclaimed the WBO Inter-Continental Super Bantamweight crown with a three-round destruction of Laryea Gabriel Odoi in his hometown of Maasin. Looking to avenge his fellow-Ghanaian is Krampah (14-3, 12 KO), who will be making his Philippine boxing debut. A former Ghanaian Featherweight Champion and WBO Africa Featherweight Championship contender, Krampah will try to bring the WBO Inter-Continental title back home to Accra. In a featured super flyweight contest, ALA Promotions star prospect Kevin Jake “KJ” Cataraja gets his first shot at a championship when he meets Mexican Victor Hugo “Scarface” Reyes for the vacant WBO World Youth Super Flyweight Championship. Lopez, the World Boxing Council (WBC) Latino super bantamweight titleholder, is 13-6-1 with six knockouts. “It’s a risky fight because Lopez had a good fight in Japan. He knocked out an undefeated fighter. What’s important right now is that we have to know early if they have it or not. I think we’ve realized that. They have to be tested as early as now. Jeo has always had the heart and always has the potential but being in the main event is different there is the pressure, the expectations of everyone. Hopefully, this will be that fight that will be the stepping board for him to the next level,” said ALA Promotions president Michael Aldeguer. Fast-rising super flyweight KJ Cataraja (8-0, 7 KOs) is eager to wrap his hands around his first title by gunning also for a knockout against Mexican youngster Hugo Reyes (9-1-1, 7 KOs) in 10-round fight for the vacant WBO Youth super flyweight belt. “If he’s ready, I’m twice as ready as him. I will take my time on top of the ring. If he has a power, I think I have more power in my punches than him,” he said. On the other hand, Albert Pagara (30-1, 21 KOs) is defending his WBO Inter-Continental super bantamweight belt against Ghanaian George Krampah (14-3, 12 KOs) in the third main feature. Also in the show, one-time world title challenger Jonas Sultan (14-4, 9 KOs) locks horns with journeyman Ardin Diale (34-12-4, 16 KOs), while former world title contender Arthur Villanueva (32-3, 18 KOs) trades leathers with Carlo Demecillo (11-5, 5 KOs). EKAArthur Villanueva of the ALA Boxing Gym will add spice to the already sizzling stacked fight card of the Pinoy Pride 45: Triple WBO Championships on November 24 at the International Eucharistic Center Convention Center (IEC) in Cebu City. The 29-year-old Bago City, Negros Occidental native will face Carlo Demecillo, the ace boxer of Big Yellow Boxing Gym, in a ten-rounder non-title showdown in the super flyweight division. Villanueva, who holds a record of 32-3-0 (win-loss-draw) with 18 knockout wins, is best remembered for fighting for the International Boxing Federation (IBF) world super flyweight title last 2015 against McJoe Arroyo. He lost in a close technical decision. His second shot for a world title also came up short when he was outperformed by South African Zolani Tete for the World Boxing Organization (WBO) interim world bantamweight title via a 12-round unanimous decision loss. Villanueva’s most previous fight was last June, where he won against Renren Tesorio via technical knockout (TKO) in the undercard of Pinoy Pride 44 in Maasin City. The Cebuano Demecillo, meanwhile, is coming off a TKO victory against fellow Filipino Margarito Moya in Candijay, Bohol last May. He holds a record of 11-5-0 with five wins by knockouts. Headlining the fight card will be WBO Oriental Super Bantamweight champion Jeo “Santino” Santisima defending his title against Mexican Victor Uriel “Yuca” Lopez. The co-main event will feature “Prince” Albert Pagara, who will defend his WBO Inter-Continental Super Bantamweight title against Ghanaian George Krampah. Kevin Jake “KJ” Cataraja will also get his first shot at a regional title when he faces Mexican Victor Hugo “Scarface” Reyes for the vacant WBO World Youth Super Flyweight title in the undercard. Jeo 'Santino' Santisima will headline the 45th edition of ALA Promotions and ABS-CBN's Pinoy Pride 45 slated on Nov. 24 at the IEC Convention Center here. Santisima, the current WBO Oriental super bantamweight champion who stopped 13 of his last 14 opponents inside six rounds, will defend his title against Mexican Victor Uriel 'Yuca' Lopez, the current WBC Latino super bantamweight title holder, this was announced during the formal launching of the Pinoy Pride 45 event at the Summit Hotel Fuente Osmeña Tuesday. “It is my dream to headline Pinoy Pride. And now it is here. I thanked ALA Promotions greatly for giving me this opportunity. I hope this event will be successful,” Santisima told the Cebu sports media. Lopez (13-6-1, 6KOs) is coming from three successive wins, two by knockouts, the last one against fellow Mexican Antonio Tostado Garcia (22-6-0, 7KOs) whom he stopped in the second round to capture his current WBC belt. Two WBO regional titles will also be at stake in the two co-feature fights. “Prince” Albert Pagara (30-1-0, 21KOs) will defend his WBO Inter-Continental super bantamweight title against George Krampah (14-3-0, 12KOs) of Accra, Ghana. Pagara, ranked No. 5 by the WBO, is also in the trajectory to challenge Dogboe, and fighting his compatriot, may add chances for the Maasin native to eventually face the Ghanian champion. “If it will happen, so be it. I'll fight Dogboe. Whoever. But I will also want fight Cesar Juarez in a rematch,” Pagara said whose only blot in his record was an 8th round stoppage by Juarez on July 9, 2016 in San Mateo, California. Pagara last saw action in his hometown in Maasin last June 9 where he stopped Laryea Gabriel Odoi, also of Ghana, in the 3rd round of their 12-round scheduled contest. Rising prospect KJ Cataraja (8-0-0, 7KOs) will face Victor Hugo 'Scarface' Reyes (9-1-1, 7KOs) of Tijuana, Mexico for the WBO World Youth super flyweight title. Cataraja, a criminology graduate who last saw action in his hometown in Tabuelan last June 16 where he stopped Indonesian Frengky Rohi in three stanzas, is positioning himself to be ranked in the world if he beats the Mexican. Also seeing action in the stacked card are former world title challengers Jonas Sultan and 'King' Arthur Villanueva. Sultan will face Ardin Diale in a 10-round non-title fight while Villaneva's opponent has yet to be named. It will be an exciting match up for both fighters and also to those undercards. Don't miss to watch the Pinoy Pride 45 Live Streaming, Result, and Replay Update. For you to watch Pinoy Pride 45 - the fight will be watched here on Philippines local time only on ABS CBN Kapamilya this November 24, 2018 starts at 10:15 am in the morning Sunday and in the afternoon only at Studio 23 network. We do our best for possible real time live streaming of Pinoy Pride 45: Quest for Greatness Fight if there's available. 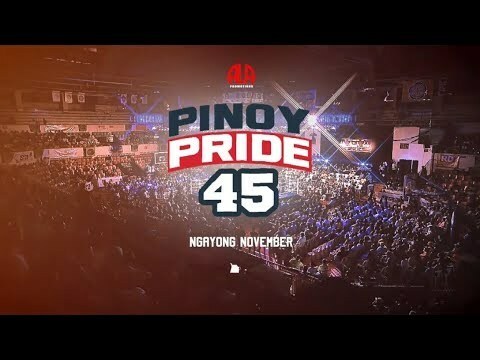 If you want to see Pinoy Pride 45 on live streaming or internet streaming via Philippine local TV, you can watch it also right here or on the other live TV streaming. For the Philippine TV broadcast, ABS-CBN will show the fights at 10:15 AM and Studio 23 at 4:00 PM Sunday. The fight results of Pinoy Pride 45 and other under card fights will be posted right here after the fight. Stay tuned. Or visit often. More updates. Our team will cover the Pinoy Pride 45 full fight video replay. You can also watch here but the video replay of Pinoy Pride 3: Fist of the Future - Pagara Brothers will be delayed for hours or days depending to the availability but we will try our best to deliver the full fight reply. 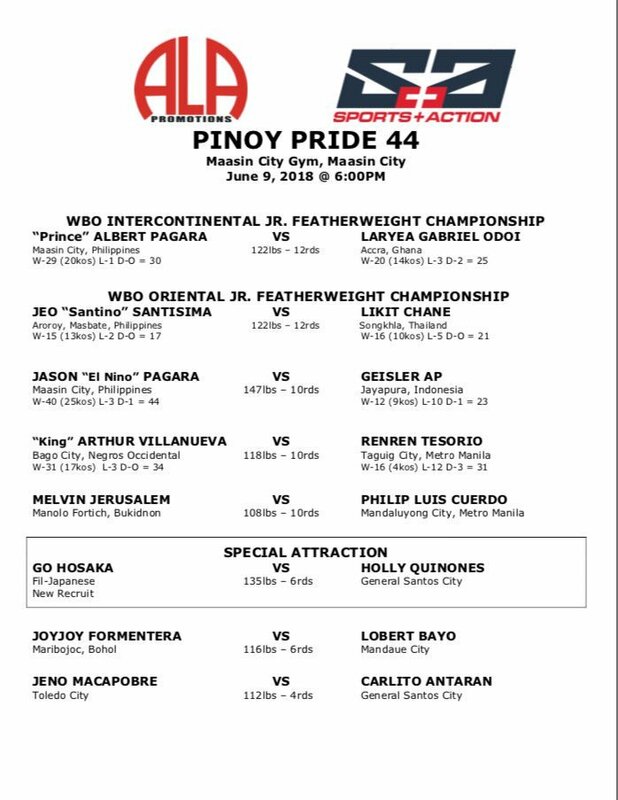 This is all about the PPinoy Pride 45: Quest for Greatness live streaming, video replay and fight results for the Pinoy Pride 45: Quest for Greatness. This update is about the Pinoy Pride 45: Quest for Greatness fight update, Pinoy Pride 45: Quest for Greatness I fight result, Pinoy Pride 45: Quest for Greatness live coverage, Pinoy Pride 45: Quest for Greatness round by round coverage as well as Pinoy Pride 45: Quest for Greatness fight results and Pinoy Pride 45: Quest for Greatness for Pinoy Pride 45: Quest for Greatness Live Streaming, Pinoy Pride 45: Quest for Greatness Fight Results and Pinoy Pride 45: Quest for Greatness Fight Replay. Also includes the under card of the Pinoy Pride 37 but mostly on Pinoy Pride 45: Quest for Greatness as the main event - So the Pinoy Pride 45: Quest for Greatness live streaming coverage, Pinoy Pride 45: Quest for Greatness Fight replay, and Pinoy Pride 45: Quest for Greatness fight results will be broadcasted by the Philippines Televised TY via ABS-CBN Kapamilya this Sunday of November 25, 2018. Thank you for following the Pinoy Pride 45 - The Quest For GREATNESS.